This flashy sequel is an entertaining entry that fits into the Rocky franchise like it's a part of the family. It knows the beats to hit regarding fatherhood and rewriting sports history and places its protagonist in the familiar position of questioning exactly what it is he's fighting for. 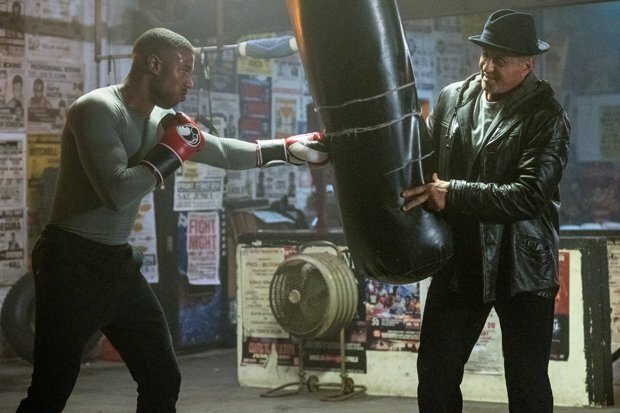 Steven Caple Jr takes over from Ryan Coogler as director and lands a few blows in both the emotional stakes and brutal bouts, as Adonis Creed (Michael B Jordan) goes toe to toe with Viktor Drago (Florian Munteanu), son of Ivan (Dolph Lundgren, reprising his role), who knocked out and killed his father in the ring in Rocky IV. For the second round in this series spin-off, Creed must defend his title as world heavyweight champion and makes the move to LA with fiancée Bianca (Tessa Thompson), so she can focus on her career. He continues training without the aid of Rocky (Sylvester Stallone), who does not support his decision to compete. Drago Junior's introduction may be a little ham-fisted, as he dwells in a cold and grey Kiev lifting cement and being bullied by his father, but thankfully the film does a good job at drumming up sympathy for his character by illustrating his bitter and manipulative relationship with his dad. There are also some gratifying cameos, complete with delicious reveals – so best not to peruse the cast list before watching. The film finds its sweet spot with its inspired score by Ludwig Göransson and game-changing musical collaborations from Kendrick Lamar, Vince Staples and Nas to name a few. It works perfectly alongside Jordan's committed performance, as he battles with his choices and traverses new challenges in his personal life. Creed's interactions with Rocky and Bianca remain charming, but the film doesn't quite have the heart of Coogler's original instalment. Adonis Creed (Jordan) must defend his world title against Viktor Drago (Munteanu), whose father killed Creed’s own father in Rocky IV. Flashy and entertaining sequel that hits all the right beats but doesn’t quite have the heart of its predecessor..